Richard Roshon isn't a scientist with a college degree. He doesn't have a foundation, a research-team, a public relations specialist or even an agent. But he does have a lifetime of practical experience, an abiding love for the ocean, and a fear that the heavy foot of mankind is leaving too deep a print on the environment. In fact, he often thinks of himself as a voice for nature. "Before the resort of Kaanapali on West Maui was built, you could skip stones to the whales." Richard said in a conversation one overcast afternoon at his modest Lahaina home. Large framed photos of whales breaching, lobtailing and flippering hung on the walls. "The migration is changing. This is the protected body, the Inside Passage between Maui, Lanai and Molokai - a place conducive to mate and give birth. Now there are dozens of boats. That's a disturbing thing for a species that relies on sound." Now in his 50's, Richard has pretty much spent his life at sea. When he was just a few months old, his parents brought a 36-foot sailboat to the islands for the wealthy owner. The family lived aboard for 14 years - sailing around the islands. Richard and his two brothers - who both later died in surfing accidents, were home schooled with tutors brought in for specialized subjects. It was an idyllic existence in Hawaii in the late 1940's and early 1950's. 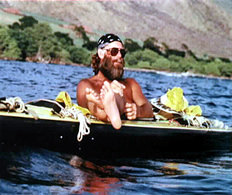 Once a surfer and a canoe paddler ("I quit when it became too big, too loud and too political," he says of paddling). Richard now enjoys the ocean from one of his two open ocean kayaks. "It's the peace. I love being out there." He said. He has stayed afloat on the ocean several days and nights at a time, heating saimin and hot chocolate over Sterno for food. "Nature is very sensitive, it needs quiet. "I live the lifestyle of a whale. My heart rate drops. I take catnaps like whales; " he went on. "After I've been out there a few days, I sleep about 45 minutes every five or six hours. But while resting, the slightest movement of wind can make me awake and aware of my surroundings. It's living in alertness." Coming back to land is frightening, especially the noise, he said. Within miles of the coastline, the sound of cars and sirens can be maddening. His experiences at sea have given him a hunger for the undisturbed music and rhythms of nature. Richard has been photographing whales since he began kayaking. "I had a dream of being Ansel Adams," he smiled. In the mid-1980's while exhibiting his photos at the Kapalua Bay Hotel, he met the late actor George Peppard. Peppard was intrigued and hired Richard to do a nature documentary on whales, outfitting him with a massive helmet with a camera mounted on it. "It was too heavy," Richard groaned and was able to convince his patron to go with a camera mounted on the kayak. 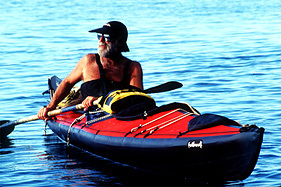 Peppard died before the project could be completed, but Richard took the footage and created a lecture, slide and video presentation called, "Man, Kayak, and the Whale". He lectured for a number of years for guests at Maui hotels, most notably the Maui Prince Hotel in Makena and the Ritz-Carlton in Kapalua. He has also lectured at the National Geographic Museum in Washington, D.C., and throughout the Pacific Northwest. Just last September he was the guest speaker at the Hermanus Whale Festival in South Africa, about 80 miles east of Capetown. Hermanus' Walker Bay is where hundreds of Southern Right Whales and Humpback Whales were slaughtered at one time. Today, the whales are celebrated during a two-week festival that includes theater, music, lectures and plenty of whale watching, ALL FROM THE SHORE - NO WHALE WATCHING BOATS. Roshon is convinced that the whales come close to the shoreline in that part of the world because their habitat is undisturbed. The coast is dotted with benches where people go to sit quietly to watch the huge mammals. "The people just whisper". Richard said. "They know how to watch nature-very quietly." Richard tells one story of being out in his kayak off Maui and hearing the mating call of a whale throughout a full moon night and into the dawn. A journal entry describes such a night as an almost mystical experience. "With the rising of the full moon there is enough light reflected from the sea to seem almost like daylight. The light from the moon catches the powerful plume of exhaled air from a nearby whale and creates a misty halo, while another surfaces alongside my kayak. They know I am there in their domain and seem to welcome me." Surrounded by a symphony of sound "you can watch the sun come up while their song echo's through the surface of the ocean," he said. When a large whale watching boat approached and idled about 50 yards away from the kayak, the singing was drowned out. Richard heard the naturalist aboard the boat announce over the microphone that while waiting for the whale to surface, they would play a recording of a whale song. Along with lecturing, Richard will take individuals out in his two-man 20-foot expedition skin kayak for a peaceful, humbling experience. He makes it clear he will not paddle after whales. On New Year's Day, after much preparation, he took a man with multiple sclerosis out into the ocean. They sat for a long time in awed silence with a whale directly beneath them. Richard has never felt any danger from any of the creatures of the sea, only the weather. Sharks who approach the kayak erratically become calm when Richard lifts the metal rudder from which, he believes, sharks can pick up and electrical current. In 1987, a 10-foot shark probably weighing about 1,000 pounds quietly swam underneath the kayak and pushed against it. Richard knew the animal could have easily overturned the craft, but it didn't. It rubbed its entire body against the length of the kayak and disappeared into the depths. Since that time the shark has swum with the kayak many times, always approaching quietly from the stern and rubbing against the boat before swimming off. Richard regards it as this guardian, or 'aumakua in Hawaiian culture. "It's nice to live with indigenous thoughts," he smiled. He noted that the connection between land and sea outlined in the "Kumulipo" (a Hawaiian chant) pairs the Humpback whale with the sandalwood. The islands were stripped of the fragrant trees through greed. Roshon hopes the whale does not suffer the same fate. After 25 years of kayaking, logging more than 20,000 miles at sea, Richard has written a book about this thoughts and experiences. "Okeanos, Great River Circling the Earth", is a self-published volume that celebrates nature, emphasizes the fragility of the environment and pleads for good stewardship. He will be signing copies of the book at Borders Books & Music at 2 p.m. Saturday Feb. 12th, in Kahului. "Man has successfully left his footprints from the top of the world to the bottom of the sea." He writes. ". We have successfully polluted nearly every square mile of the world's oceans." "The world's oceans are all connected. They depend on each other in one way or another. We, too, as a society of human species are also connected to every living thing. We must learn to live together as one." Richard's note: After my return from South Africa in October of 1999, I worked several months on a document pertaining to implementing Walker Bay of Hermanus, South Africa as a 'Marine Sanctuary". This document was forwarded to the Minister of Environmental Affairs, and other organizations.